Welcome to the 11th Annual Essex Youth Hockey Thanksgiving Yamboree. Our tournament committee welcomes all players, coaches, referees and spectators with a special welcome. We sincerely appreciate the participation of ALL teams that travel to attend our Cross Ice Mite Yamboree. We truly hope that all the players, coaches and parents will have an enjoyable time at the event and when the Yamboree is over, everyone will travel safely home, with memories that will be treasured forever. Hopefully, new friendships will be made, and previous ones renewed. We will again have a full snack bar throughout the tournament. We will also have gift baskets for families to raffle-bid on and T-shirts for the kids to purchase and much more. We could not hold this tournament without your programs attending. We can’t thank you enough for attending and making this one of the biggest Cross Ice mite tournaments in the Northeast region. I would personally like to take this opportunity to express my sincere appreciation to all of our tournament volunteers. Through consistent hard work, level of commitment and perseverance, each and every one of you have made this year’s Yamboree a significant life-enhancing element of our personal lives and provided a wonderful and strong sense of social cohesion in our own community. I know for a fact the players, coaches and families that attend will see the passion and the hard work that is being spent on this year’s Yamboree. A special thank you is once again extended to the Mount Mansfield and Essex High School Varsity Hockey Programs whose mission is to provide assistance for a variety of tasks throughout the tournament. They often score games, help with bumpers and run the score clock when needed. We truly depend on former EYHA players and local high school athletes to help and I could not be more proud of the help they provide year after year. We also appreciate the continued support of ALL our community sponsors. I am real proud to live in and be a part of such a great community. Good Luck to everyone, have a great Yamboree, and most of all have fun with the kids and I will see you all at the rink! The Registration "Tournament Information" is not currently available. Last year we had 33 teams, 325 hockey players and a lot of fun and smiles. 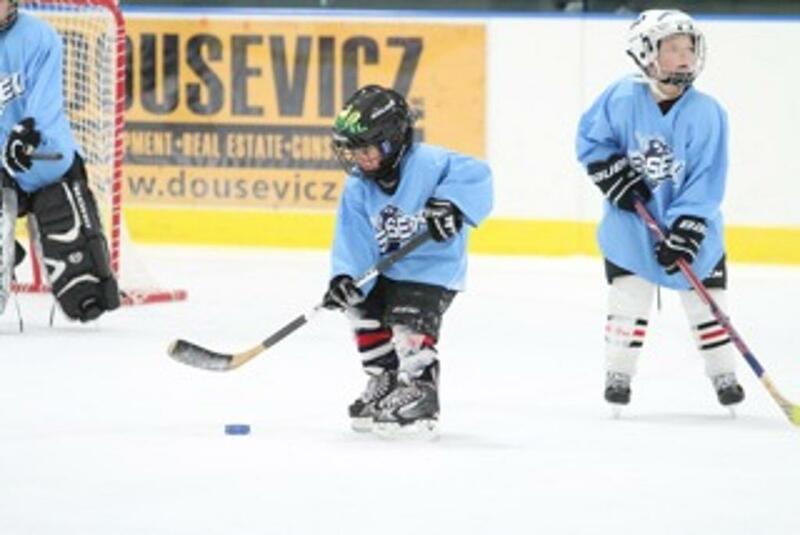 Our cross-ice mite tournament has become one of the largest mite tournaments in the region. We have teams from Vermont, New Hampshire and New York that attend year after year. Our goal is to provide travel and house mite players, coaches, and families with their very own tournament that will make for the best memories of the season. Our staff makes sure we have great competition, thoughtful scheduling, great prizes and attention to detail that is second to none. All players will receive a souvenir and the top two teams receive a medal and a trophy. We will have shirts for sale again this year as they were a big hit last year. We will post a link for shirt orders here soon. PLEASE NOTE: This is an invitational tournament for mite teams with comparable ability to compete favorably. Any misrepresentation of a team's level of play AKA: Tournament team, Select or Elite - will be met with blacklisting from future tournaments. The primary goal of this tournament is to have fun, not win trophies. Cross Ice teams should be a cross-section of Major/minor players and ability. EYHA is offering a chance to order your tournament t-shirts before the big tourney. You can order your whole team their t-shirts and pick them up when you get to the tourney. It is a great way to remember a fantastic tournament. We also teamed up with a local hotel this year with a special group rate for Friday night for families that want to stay in the area. Details to Follow. Below you will soon find the reservation link families can use to make online reservations.